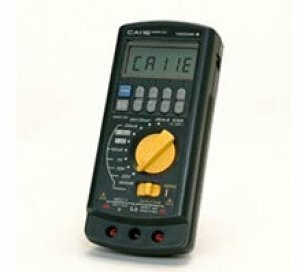 Source and Measuring of Voltage and Current: Generates and measures voltages up to 30 V DC and currents up to 24 mA DC. Improved display resolution for current: The generation/measurement resolution has improved to 0.001 mA. 20 mA SINK Function: Absorbs the voltage supplied from an external power supply to its H terminal and simulates a two-wire transmitter making it ideal for loop checks. 4-20 mA and 1-5 V DC Step-up/down Function: The output level can be changed between 4-8-12-16-20 mA signals by one touch for the 4-20 mA DC output, and between 1-2-3-4-5V signals for the 1-5 V DC output, for efficient calibration work. Sweep Function: Increases and decreases the output level to the preset level at a constant rate for the selected sweep time (16 or 32 seconds). The sweep function and sweep time are set by the internal dip switches. Rubber boot, strap and accessory case can be chosen as standard accessories to improve impact resistance and make it easier to carry. (The calibrator cannot be stored in the carrying case when the rubber boot is attached.) The roomy case easily holds the calibrator without having to disconnect the lead cables. 20 mA SINK Function: Absorbs the voltage supplied from an external power supply to its H terminal and simulates a two-wire transmitter making it ideal for loop hecks. Used to set the output signal level. A pair of up/down keys is conveniently located immediately below each digit in the LCD panel. The rotary switch simplifies range selection: just leave the switch set to the most frequently used range.